TheArmenianKitchen.com : Looking for a hearty soup to serve this winter? 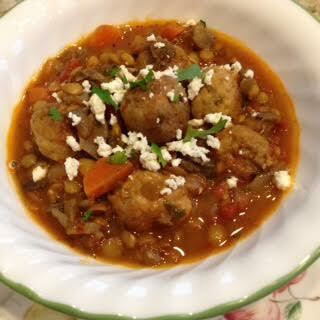 Try Lentil Soup with Meatballs! Looking for a hearty soup to serve this winter? Try Lentil Soup with Meatballs! I can’t take credit for this particular recipe, but I’ll happily share my source, and my rendition. The source: The Washington Post featured this recipe which was adapted from “Soup Swap: Comforting Recipes to Make and Share” by Kathy Gunst (Chronicle Books, 2016). See my rendition below: This recipe sounded so enticing, I just had to make it. By adding a few of my own ingredient preferences, and tweaking it here and there, the dish became more personal. Serve it with crusty bread and that’s all you and your tummy will need for a very satisfying meal! 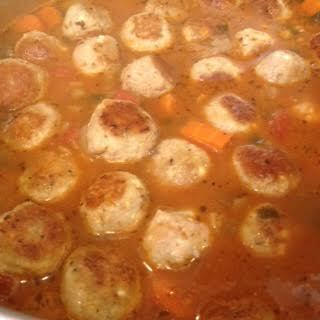 Lentil Soup with Meatballs, ready to serve! Lentil soup simmer on the stove. Gently heat the olive oil in a large pot over low heat. Add the onion and garlic; cook, stirring, for 5 minutes; add the dried herb blend, season lightly with salt and both peppers, and cook for 1 minute. Add the mushrooms and carrots; cook, stirring, for 2 minutes. 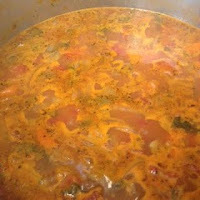 Add the lentils, tomatoes with their juices, and tomato paste, stirring until all the ingredients in the pot are coated. Increase the heat to high, add the chicken stock or broth and bring to a boil; reduce the heat to low and add the parsley. Partially cover; cook for 45 minutes, stirring occasionally. Meanwhile, line a plate with paper towels and set aside. Combine the ground meat (I used ground turkey), garlic, dried herb blend, egg, feta cheese (if using), bread crumbs and a sprinkling of salt, black pepper, and Aleppo red pepper in a medium bowl. With clean hands, gently mix the ingredients until well-combined. 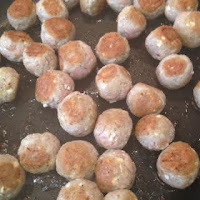 Form 3/4-inch to 1-inch sized meatballs until meat mixture is used up. 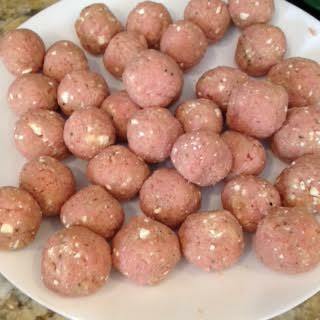 Mine yielded 35 meatballs. Heat the olive oil in a large (12-inch) skillet over medium-high heat. Once the oil is shimmering, add the meatballs making sure not to crowd them. If necessary, cook in small batches. Cook meatballs on all sides for about 5 minutes until evenly browned. (Please note: The meatballs will not be thoroughly cooked at this point.) Use a slotted spoon to transfer them to the paper towel-lined plate to drain. Meatballs and soup simmering harmoniously! After the soup has cooked for 45 minutes, add the browned meatballs. Partially cover and cook for another 30 to 45 minutes or until the lentils and carrots are tender and the meatballs are cooked through. Stir now and then. Taste; adjust seasonings if needed. If the soup thickens too much, add a bit more liquid and heat for an additional 5 to 10 minutes. Ladle the soup into individual bowls; garnish with parsley and/or the feta cheese, if desired. Serve with crusty bread on the side!